The vehicle is a 1/72-scale all cast resin Italian armored car. 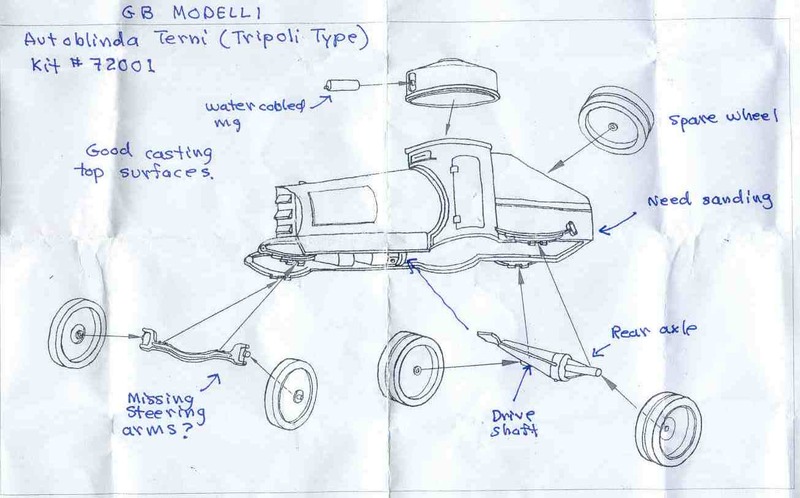 The package describes the vehicle as the Tripoli Type implying to me it was a variant, or style, serving in North Africa: Tripolitania. My references state that it was developed in late 1918 and variants served into WW2. In the half dozen historical photos I have found of this armored car there are significant variation in the vehicle apparently reflecting over 20-years of use and upgrading. For example, in North Africa several of these had the armored box mounted on a Fiat Spa 38R truck and a 12.7-mm Safat machine gun in the turret with the top removed. 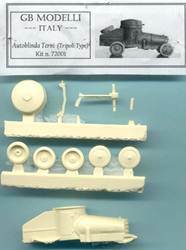 The model consists of 10 light amber colored, cast resin parts, a solid hull casting with doors and hatches closed, five roadwheels (one is a spare wheel, actually a set of paired wheels), a turret, water cooled machine gun, and front and rear axles and drive train. Casting looks smooth and pretty good; no air bubbles or warped parts. Clean-up of the parts looks easy with a small saw and a sanding stick. The kit comes in a small plastic bag with the label at the top of the above photo. The label has a small black & white photo of the right side of the armored car. The vehicle has a look similar to other armored cars of the 1920’s and 1930’s. The cylindrical body and engine areas are unique though. The roadwheels appear to have solid rubber tires with little or no tread. The rear wheels are doubled, side by side. I just cannot help adding extra detail to a model. Based on my knowledge of motor vehicles I took the liberty of adding some details such as an exhaust pipe, steering arms and brackets to the suspension. This is pure guesswork and I do not recommend that you copy this model for details. Based on one of the few historical photos I have found, a step has been added below the doors, made from brass wire. One of the rear axles was broken so I had to add an extension made from a styrene rod. The mounting holes on the wheels were also opened up more with a drill. Rivet and panel lines look good. A small error I did not correct is at the back of the turret base, there is a small section of a protruding rim that was removed when I cut the turret from the pore plug. I replace the broken small machine gun barrel on its water-cooled jacket. No decals markings are included nor painting instructions. In North Africa I understand that this armored car would be painted a flat light tan color. If serving in Europe during the 1930’s and 1940’s I believe a flat gray-green color would be appropriate. The tires should be dark gray color (not black when taking scale-effect into consideration). 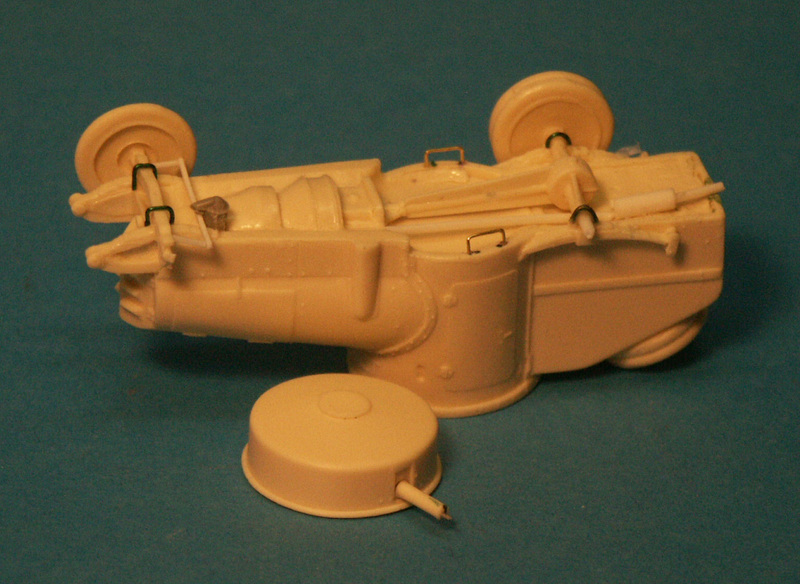 The model was painted with light tan Model Master Acrylic paint for a car serving in Libya, then brown and black point washes used and the top surfaces lightly sprayed with a lighter tan color to represent fading by the sun. The tires were painted Poly-S Grimy Black color to represent the solid rubber. Water slide decal license plates from a DOC Models kit were applied fore and aft over a clear gloss coat. The kit is well done and I recommend it for beginners to advanced modelers. Assembly was quick and simple, but be careful to glue parts on straight and in the right locations. 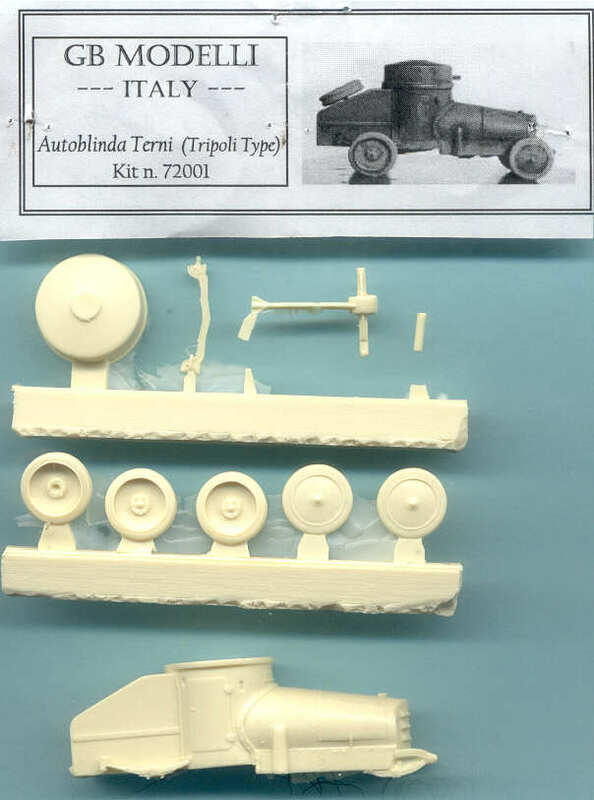 Using reference photos you may wish to detail it with grab handles, decal markings from other Italian AFV kits, and other items. I found nothing in my Italian armor books on this vehicle but was able to find articles and photos doing an online web search.